Joe Jessup, who graduated from Wright State in 1998 with a bachelor’s degree in management information systems, is the senior manager of software development on Amazon’s Alexa. When alumnus Joe Jessup ’98 was first hired at Amazon working for the Alexa engine in 2016, the first thing he asked his Alexa was, unfortunately, pretty boring. But Jessup and his career in business and technology have been anything but boring. The Raj Soin College of Business grad has worked in nearly every position in business imaginable at various companies, large and small. His expertise lies in setting up strong project management practices and driving organizational change for the companies he’s worked for. These include John Wiley & Sons, Thomson Reuters, Thomson Financial and ILX Systems. 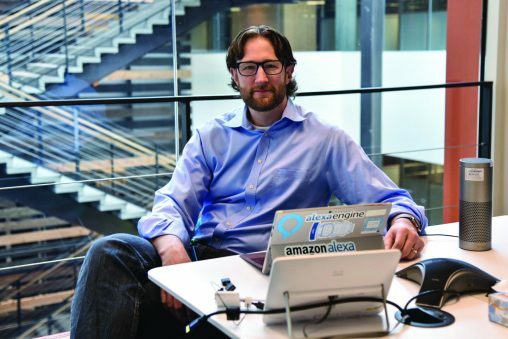 As the senior manager of software development on Alexa, Jessup leads a cross-functional team of project and product managers, engineers and operations managers. Alexa is capable of music playback, making to-do lists, setting alarms, streaming podcasts, playing audiobooks and providing weather, traffic, sports and news. Basically, he works each day to make Alexa even more awesome — and getting it to work better and better for the consumer. Amazon Storytime is a free “skill” on Alexa that offers a collection of professionally narrated short stories for kids ages 5 to 12, while the NORAD Santa Tracker conducts a special mission on Dec. 24 tracking Santa across the globe and keeping him safe as he delivers Christmas presents. Prior to moving to Seattle with their 10-year-old daughter, Jessup and his wife spent 17 years living and working in New York City. He moved to New York one month after graduating from Wright State with his degree in management information systems. “Amazingly, I moved without a job, but was able to secure an entry-level position with ILX Systems within two weeks,” he said. From there, he was able to quickly move his way up within the company, eventually spending 14 years there, working for ILX’s parent company, Thomson Reuters, in numerous technical roles, including software development, product management and technical program management. While with Reuters, he traveled extensively across the globe to locations including London, Paris, Rome, Madrid, Bangalore, Chennai, Hong Kong, Tokyo and Beijing. “Between 2011 and 2014, I created the first technology Program Management Office for (the) academic publishing company, John Wiley & Sons,” he said. Jessup credits Wright State with his strong work ethic and developing his love for technology and business. During his time as a business student at Wright State, he was just as energizing and determined as he is today. “Although I started out majoring in computer science, I graduated with a B.A. in management information systems after realizing that I was also interested in business concepts,” he said. He was also just as busy, holding several campus jobs throughout his four years, including serving as “support” for the residential phone system when Wright State dorms still had landlines. He also worked as technical support in the university’s many computer labs and he sold advertising for The Guardian student newspaper on the side. “I remember fondly selling ads for The Guardian. To this day, it is the only sales job I have ever held, but I still use some of the skills I developed then,” he said. He also worked as an RA with Residence Life and served as president of the Residential Community Association, where, he said, he launched one of his proudest achievements as a student — the first-ever Parents’ Weekend at Wright State. Because of his dedication to Wright State and the structure his education brought to his career, Jessup recently joined the Raj Soin College of Business Corporate Advisory Board, a broad spectrum of leaders in business and government assigned to assist the college in long-term strategic planning and program development. “I want to make sure that young adults growing up in Ohio continue to have that same opportunity that I did,” he said. He is also always willing to lend a helping hand to Wright State students in need of career advice and just met with a recent Wright State graduate who joined Amazon in Seattle. To any students looking into working for larger companies like Amazon, he has two important pieces of advice. Jessup hopes that one day his daughter might consider attending Wright State. Two years ago, he committed his support to Wright State by endowing a scholarship in her name: The Sadie Quinn Patrick Jessup Endowed Scholarship Fund. The fund was established to support undergraduate students in the Raj Soin College of Business or those majoring in computer science in the College of Engineering and Computer Science. As for his future endeavors, Jessup is eager about his future with Amazon. He jokes that he has officially “drunk the Kool-Aid” of Amazon’s tech world and says that he’d love nothing more than to keep building and launching amazing products for this brand.